Lake Toba is surrounded by highlands and jagged peaks on the island of Sumatra. The lake spreads out to meet dramatic cliffs and forested slopes, which extend to the shoreline. It is the largest lake in Indonesia and the largest volcanic lake in the world. Hiring a motorbike is a great way to travel around the lake. There is very little traffic and along the way the friendly locals wave and are very happy to welcome you. The one thing that strikes you about Lake Toba is the slow pace of life. It is an extremely peaceful place where low impact tourism has not detracted from its laid-back atmosphere. The lake is dominated by the island of Samosir, similar in size to Singapore, at its centre. Most visitors to the island stay in lakeside homestays and cottages in the little village of Tuk Tuk, located on its eastern peninsula. Stretching along the shorefront a string of local eateries and small bars overlook the lake, including cute little cafes with secondhand books crowding their walls and there is even a German bakery. 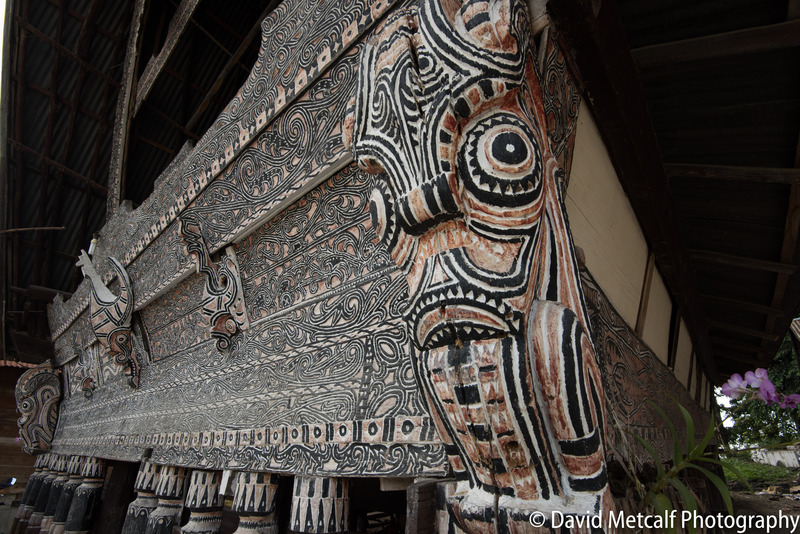 I was on a mission to follow up on some legends I had heard about of a bloody historic past, and began my stay on Samosir Island by visiting the tiny village of Ambarita, four kilometres from Tuk Tuk. This village still houses relics of an old stone courthouse. After my dose of history, I headed for the beach. With my trusty motorbike, I found my way to Parbaba Beach (Pasir Putih Parbaba). Stopping at one of the small warungs there, I picked my fish from a number still swimming around in a bucket. I sat at the water’s edge, enjoying a fresh seafood platter with piles of vegetables. The next day I set aside the whole day to explore the lake by boat and visited Binangalom Waterfall, which is located on the far side of the lake. I packed a picnic lunch from my cottage stay and set off for the waterfall. The lake waters were very calm and crossing the lake we passed a series of towering escarpments interspersed with cultivated land and small fishing villages. A scenic delight. Swimming in the warm volcanic waters of Lake Toba is a thrill. In Batak language, Binangalom means ‘river falling,’ and to swim under this thundering river fall, which cascaded down in seven levels was my living, breathing Toba moment. During the next three days I visited some of the traditional weaving villages in the region and was impressed by the quality, variety and the intricacy of the weaves. 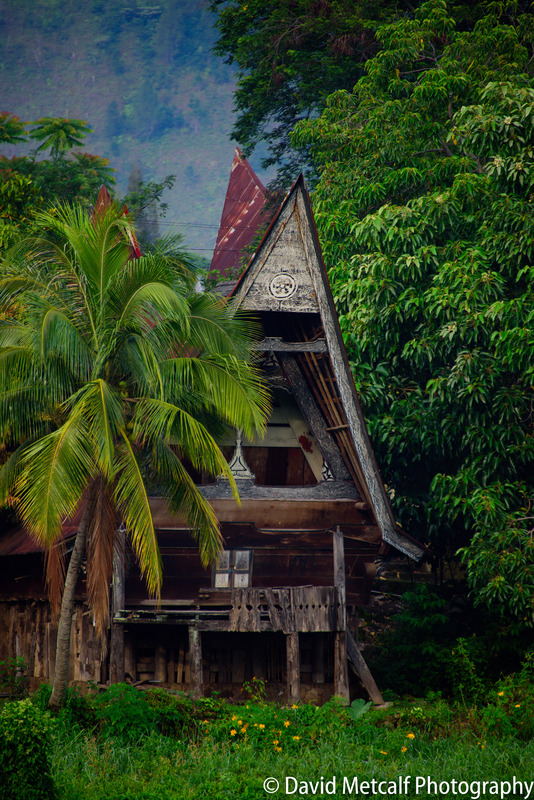 Weaving is just one way the Batak Toba people have kept their traditions and culture alive. I also fell in love with the elegant, traditional Toba Batak houses with their distinctive concave roofs, and house walls painted with elaborate motifs. Now, a new Garuda air link from Jakarta direct to Silangit creates an alternative to taking the five-hour drive from Medan. By flying to Silangit, you save two hours travel time. Lake Toba is still a little too far from Medan to make it a frequent weekend destination for local city dwellers, so this means you can have the place mostly to yourself. 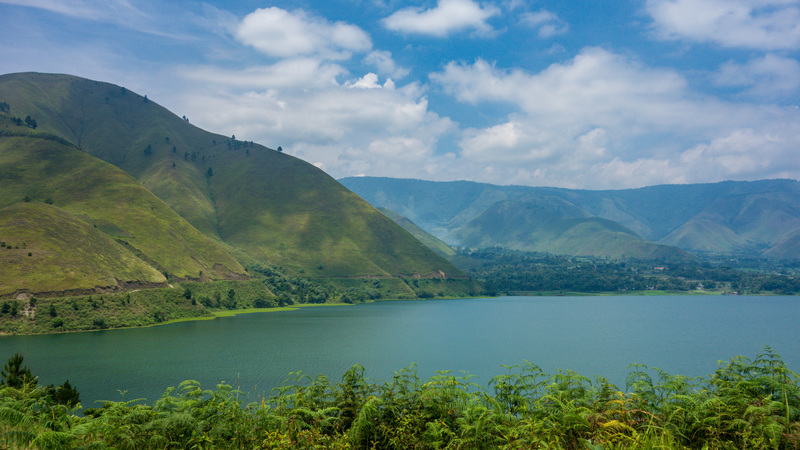 Lake Toba is undeniably one of the most spectacular natural wonders of Indonesia. Wonderful waters, weavers and people await you there – and don’t forget to take the plunge into the magnificent Binangalom Waterfall. 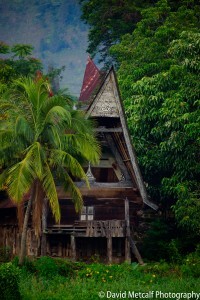 Traditional Batak Style Villas, Suites and Deluxe Rooms. This lovely waterfront cottage stay has sprawling gardens, a private jetty, a large pool and a restaurant serving Western, European, Chinese and Indonesian cuisine and uses fresh organic vegetables. There is an on-site German Bakery. Wonderful staff and impeccable service. Your hosts, Annette and Antonius Silalahi are German and Batak Toba. The Coffee Roastery serves organic, local Robusta and Arabica Sumatra beans, famous for their full chocolaty taste. Guide: Pak Hasan – Local Batak guide with good knowledge of history and finding unique places to visit. He will organize an available good local driver.